With few players left from the Super Bowl teams, the spotlight on Wilson is as great as it's ever been. A trip to Soldier Field on Monday night will allow the Seahawks to reminisce about what was one of the franchise’s most pivotal moments during a little more innocent time — a 23-17 overtime victory over the Bears in 2012 that is generally regarded as Russell Wilson’s true coming-out party. That victory came a week after a loss at Miami dropped Seattle to 6-5, a defeat that was followed hours later by the news that Richard Sherman and Brandon Browner had each been suspended for using PEDs (Sherman would later win an appeal), concurrent events that appeared to have the Seahawks doomed to another lost season, and with coach Pete Carroll nearing the end of his third year as coach, lots of questions about where everything was headed. But the next week in Chicago, Wilson — in what was his 12th career game — led a 97-yard drive to give Seattle a 17-14 lead with 32 seconds left, completing a pass to Zach Miller to convert a fourth down along the way. Then, after the Bears got an improbable tying field goal when current Seahawk receiver Brandon Marshall caught a pass for a 56-yard gain over Sherman, Wilson led a 12-play, 80-yard drive for a touchdown to open overtime, twice running for the needed yardage on third downs. 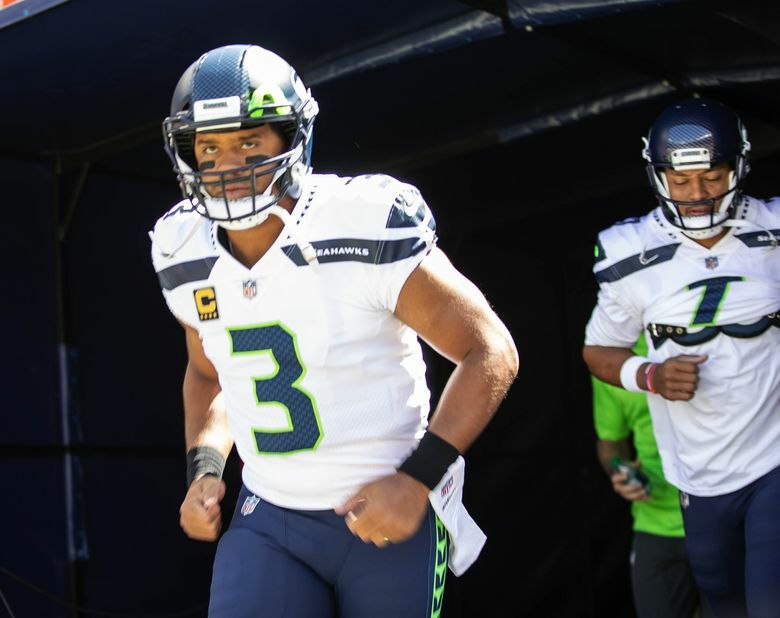 It was a performance that gave the last evidence the Seahawks needed to conclude they had a quarterback who truly could lead them to heights never before reached in franchise history. The victory sparked a five-game winning streak to end the regular season that led to all the good times that followed — the stunning 150 points over the next three games that truly announced the Seahawks as a team on the rise, the run to the Super Bowl title in 2013, five consecutive seasons with at least one playoff victory. As the Seahawks return to Chicago on Monday, their situation feels as precarious as at any time since the week before that 2012 game — something the team seemed to acknowledge with the signing of free agent linebacker Mychal Kendricks despite the fact he faces 30 to 37 months in jail after pleading guilty to a felony charge of insider trading. Doug Baldwin, Bobby Wagner and K.J. Wright are all out, leaving just three players from the team that won the Super Bowl in uniform Monday — Wilson, safety Earl Thomas and guard J.R. Sweezy. And that means more than ever, Wilson will be expected to carry the Seahawks. If in 2012 and for a few years beyond that the Seahawks could depend on one of the best defenses and running games in the NFL as their backbone, they now need — and expect — Wilson to do most of the heavy lifting. That became apparent during and after the 27-24 defeat at Denver last weekend. Wilson was hardly bad, throwing for 298 yards against Denver and three touchdowns and just one interception until a last-play desperation heave resulted in another turnover. Take out that pick and Wilson would have had a passer rating of 105.3, doing so with Baldwin playing just 11 snaps and not making a catch, behind a still-evolving offensive line and with a running attack held to fewer yards than all but two games last season. But what stood out to many fans and analysts afterward were the plays Wilson didn’t make, specifically twice trying to spin away from rushers on third downs and instead being sacked to kill drives and then fumbling a snap on the final drive when Seattle needed only a field goal to force overtime. Maybe it’s simply that so many of the team’s most recognizable names are gone that the scrutiny of Wilson’s play seems more heated than at any time in his career. Or maybe it’s the reality that with all of those names gone, the Seahawks don’t stand much of a chance if Wilson plays a merely normal game. It’s Schottenheimer who was hired to replace Darrell Bevell with one thought being the team wanted to assure Wilson felt accountable and challenged. The Denver defeat came roughly 48 hours after a Sports Illustrated story detailing that some anonymous Seahawks of the past and present felt that the coaching staff too often let Wilson slide, among other transgressions. Think what you want of the story and the allegations, but its mere existence showed how different the perceptions and expectations are for Wilson now compared to the last time he stepped on Soldier Field. Asked about the story, Wilson sidestepped the specifics while defending his overall body of work. When it comes to the Seahawks, though, everything else suddenly seems worth worrying about, leaving Wilson needing to “do it all,” as he finally did that glorious 2012 day in Chicago, with increasingly little room — or acceptance — for error.